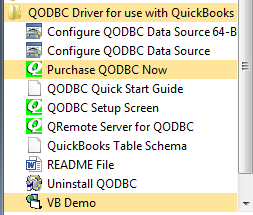 When you install QODBC below menu items are created under QODBC Driver for use with QuickBooks folder in start menu. Purchase QODBC Now will navigate you to QODBC website for purchasing a QODBC license. QODBC Setup Screen will help you to configure different setup option in QODBC. You can perform different configuration from QODBC Setup Screen like: setup auto login to QuickBooks, check QODBC & QuickBooks SDK logs, setup Optimizer option, configure other Advanced Setup options. QuickBooks Table Schema will navigate you to QuickBooks table Schema/Data Layout page using that link you can get details about the QODBC table & report schema. You will get details about each table relation with other tables, table/report column, report parameters which are supported.